Where are you from? I thought I knew. Until the day where it all clicked. Suddenly, reality as I had known shattered. I was lost. Where are you from? That wasn’t the question anymore. Starting secondary school, that’s who I was. I’d gone the entirety of my primary education as that, who I was to question it? I had lived in France, with my French name, French language with the now sort of English accent. Starting at a new school, it didn’t seem as I had anything to worry about; nothing major anyway. After all, this time I could actually speak the language, I was speaking a combination of English and French at home, I had forgotten some French at this point. My biggest worries were learning to tie my shoelace and learning how to do my tie properly. But something was different. I noticed it straight away the moment we all asked to gather together for our first assembly. Black people! Like… LOADS of them! Now let me explain… Yes, I know I’m black too. 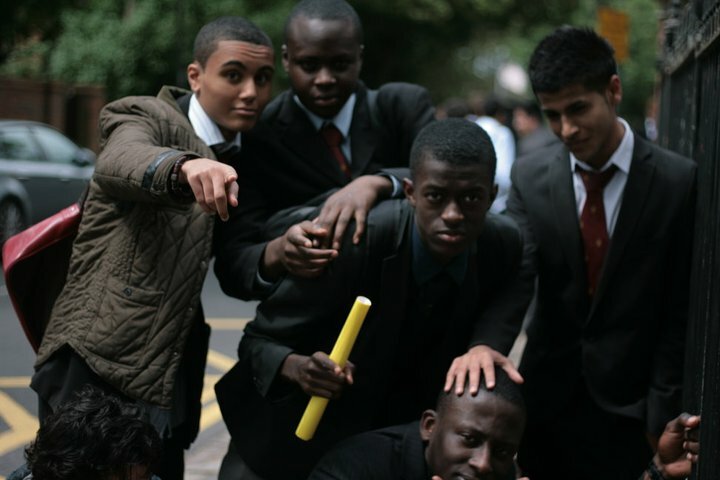 You have to understand that at my primary school when I first started, I was the only black guy in my year group and by the time I finished, there was only a handful us. Not only black people, there were people of all races from different backgrounds in this school, it was reminiscent of living back in France. I was just excited that’s all. The first year made me little wiser (can be argued), but something was changing. Something just wasn’t right. In hindsight, I probably shouldn’t be surprised. I was around that age after all, people grow up and start to figure out who they are as they go through a trial and error, until they get to the point that they’re comfortable with who they are; whoever comes out the other side. Maybe this was the same. Like I said, going to secondary school, I was known as the French guy and that continued throughout secondary school. However, I’d look across and I see these guys, who were confident and proud. They might as well have been saying, “I’m Proud”, “I’m Confident”. Why couldn’t I do the same? Was I not proud? Was I not confident? Or maybe I was afraid? Even… ashamed perhaps? In many ways they were no different from me, could they all speak the mother tongue of their parents’ country, had they stepped on its land? If so, I’m jealous, if not I was even more envious they could be so proud of where they came from. I wanted to be able to do that, but I couldn’t. Why? Well, that’s one question that I knew the answer to. All of sudden, there was no escape. It was in my face, constantly; on the television, on the radio, on billboards on the side of buildings and of buses. A film which depicts the tragedy that occurred in the country that I’d eventually accept as my heritage. In ’94, by the time I would reach the age of one, this country had taken the lives of dozens of my family members. Brothers and sisters, sons and daughters, were taken from my family from us before I could sentences together. If it wasn’t for my uncle, who had advised my mother, his sister, against visiting, I too may just be a memory. My uncle, along with close to million other lives, as well as the Rwanda itself, were taken from us. In the homes of my family, you would always seen the photographs of those that had left us way too soon. Yes, I was ashamed. I was too young to understand the rich history and culture that preceded it, the resentment I felt caused me to distance myself this country. Until I received my first passport in 2004, I was the boy with no country. As much as I could tell people that I’m Dutch, or French, or even British, my papers always highlighted the same thing. I was the boy with no country. My outlook and position on Rwanda changed after my first trip to Africa. Well, not quite Africa, I was next door in Mauritius. It was my first time outside the UK not named USA, surrounded by a completely novel cultures, an experience that really shook up my mentality. It showed that, if you looked past all the darkness of ones history, there is something rich and beautiful there. Obviously, at the time I was too young and not cognisant of this, however hindsight is always 20/20 and I can appreciate that moment as turning point in my life. I was ready to embrace my history, the good, the bad and the ugly, the whole package. Mauritius taught me that if you look past the surface, you’ll find something that might just surprise you. This experience helped me build the courage to accept my history, my heritage, and so I can begin learning more about my country. I would question my parents, snoop in on conversations between uncles and aunts, and listen to the stories of my grandparents’ lives and upbringing. Slowly, a mental image was being constructed of what this country was like before it was torn, how they played, how they learnt, how they lived. As hours turned to days, days to months, months to years, after travelling to many new places around the world learning more about other people’s countries and cultures, I was more accepting of my Rwandan heritage. More importantly, I was comfortable with it. Who are you? Where are you from? These questions didn’t bother me anymore, but there was still one important thing for me to do. I had to walk on the land that my parents, their parents, and their parents walked on. I had to visit Rwanda and see it for myself. Stepping out the airport, I felt awesome. Like I was a footballing hero bringing home the World Cup. Like a Michael Jackson stepping out on stage doing the moonwalk. There were no crowds to welcome, to them it’s just a regular day but that’s how high I felt. It was an experience like no other, it felt like Kanye West’s song Homecoming was playing constantly throughout that week. If I had an ounce of resentment or hatred in my heart it had vanished by the time I boarded the plane to leave this land. From staying in a chalets in the mountains to visiting my uncle’s grave, visiting family who had piles of straw for beds to being face to face with a bull, I had a new appreciation for the culture that I was brought up into and how fortunate I was to be in the position that I was in. in the comments. This is a story of how I was once lost, searching for who I was, and how I found out more about my country, ultimately I finding myself and gaining an identity. I’m not the first who has ever wondered who they were, and I certainly won’t be the last. For some, they will discover who they are overnight, for others it may take decades. Whether it’s sexuality, religion, career, or in my case, nationality, it’s not an easy process and it’s definitely not a walk in park. But once you find yourself, it’s the most liberating feeling. I hope you enjoyed my story, please let me know what you thought of the story (both part 1 and 2) in the comment section below or contacting me on social media on Twitter. Thank you for your continued support and don’t forget to share and subscribe!